The nerine is better known as a cut flower than as a pot or garden plant. The reason for this is that the bulb originates from South-Africa, which makes it not really hardy for European winters. But hybridisation is very common in the world of flower bulbs and growers were able to create better nerines that are fully hardy in our climate. Usually, hybrids are made between the different species of the nerine, but there also are some new hardy varieties bred by crossing nerine bowdenii with the amaryllis 'Belladonna'. These new type of nerines are called amarine. I have high expectations of amarine as a garden plant; planting trials have showed us that amarines are still doing well 5 years after planting. In the third year and afterwards often more flowers are thrown due to offsets that grow big enough to flower as well. Definitely worth trying them in your garden, as the cheerful flowers of nerines and amarines are a true delight for your garden during autumn. The nose (top) of the the bulbs need to be 2 centimeter above the soil and the bulb solidly planted.. The soil has to be moist during the first months after planting so the bulbs can develop roots. Cover the bulbs during winter with a peat, leaves or straw. When you plant a nerine or amarine too deep the bulb will start rotting. That is why the tip of the bulbs need to be a few cm above soil level. Keep the soil moist after planting, so the bulbs are able to root well. This really is important because when the leaves start to grow before new roots are growing the flower inside the bulb, that needs to bloom in the fall, will be aborted. Often, springtime can be short of rainfall so make sure the just planted bulbs stay moist. Do not plant the bulbs too close to each other, either: they are most beautiful when they are about 25 centimeters apart. By spacing them out more they also get more light which is benefitial for flower production. Personally, I like nerine best when she’s spread out widely through the garden or border. Nerines and amarines are like a perennial for many year on the same spot so give them space to develop. 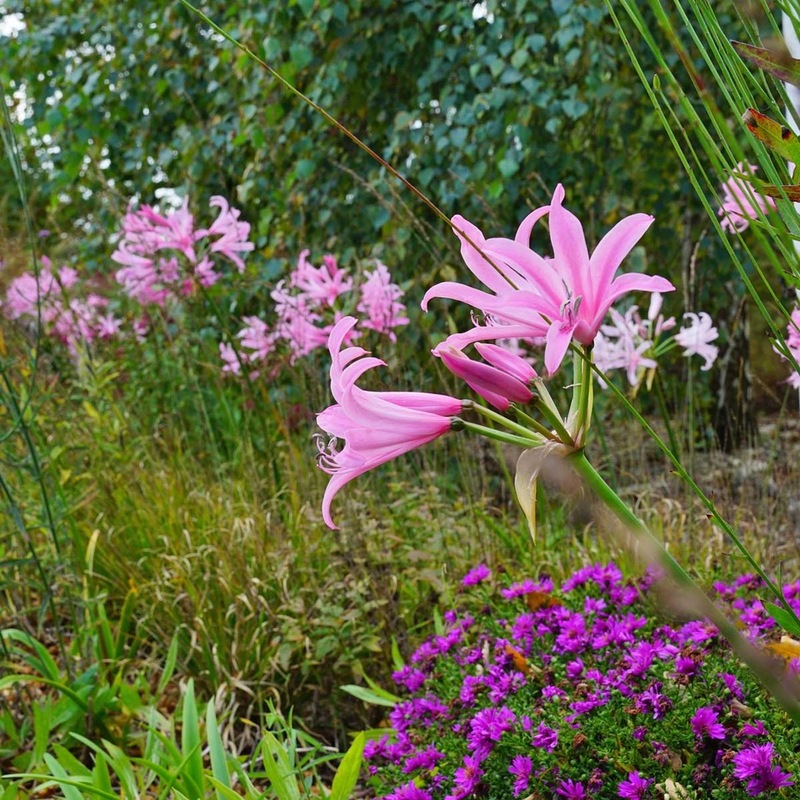 When you plant nerine in large numbers, you’ll be surprised how nice they look in the autumn. She is the goodnight kiss of the garden before she goes to sleep for the winter.